Image courtesy of Masoumeh Mohammadkhani. While in the fourth grade 12 years ago, Masoumeh Mohammadkhani was told to remove her hijab for the singing of the Pledge of Allegiance. One of her classmates confused the religious veil for a hat. While Mohammadkhani quickly clarified that her hijab was not a hat, she was nevertheless shocked by this comment. “It was the first time I realized that it could become a problem,” Mohammadkhani, a 21-year-old NYU psychology major from Sayreville, N.J., said. While all references to her hijab were not as explicit as her classmate’s, Mohammadkhani noticed subtle biases in her daily life. During a typical trip to the mall she was often ignored by sales people, which she attributes to them either not wanting to offend her by suggesting clothing she would not have felt comfortable wearing, or to a genuine bias against Islam. She faced the same isolation on sports teams. Her coaches never directly discouraged Mohammadkhani from dressing modestly, however, her needs were not accommodated like those of the other student athletes. She never anticipated this type of discrimination when her mother inspired her to wear the hijab and conservative clothing at nine-years-old. “I really loved my mom, and she was always such a source of inspiration because I thought she was so smart and she was my role model…I wanted to wear one so I could be just like her,” Mohammadkhani said. Although she primarily wore the hijab to emulate her mother, Mohammadkhani’s parents made sure that their daughter was aware of the veil’s religious significance, which she happily embraced. Although this verse does not specifically mention women’s hair, some Islamic women do interpret the line to mean that their heads require covering as a sign of respect for themselves and others. While Mohammadkhani understood the religious context behind her hijab, she said that she was less aware of how people’s perception of her would change and, at the time, was just excited to imitate her mother. “I think I was really unaware of societal standards,” Mohammadkhani said. However, two years after she began wearing the hijab, Mohammadkhani began to reevaluate her religious beliefs. As an increasingly independent 11-year-old, she no longer felt obligated to demonstrate her piety through her hijab. Mohammadkhani said she realized she could still be a faithful Muslim despite what she wore. Although she was inclined to stop wearing the hijab as she matured and her religious beliefs evolved, Mohammadkhani continued to wear one until she was 14-years-old. She did not want to be questioned by kids at school for the sudden change. More importantly, she did not want to disappoint her family. It wasn’t until she transferred to a high school in another town that she finally chose to remove the hijab and dress in a more typically American fashion. Despite her personal decision to abandon the hijab, she respects American-Muslim girls who choose to cover their hair. “I admire how much strength they have because it’s not the easiest thing,” she said. Through her firsthand experience, Mohammadkhani knows how much the hijab is judged and misunderstood, especially in Western cultures. She also finds it ironic that the West views the hijab as a form of oppression. “It’s funny, because in [Muslim] cultures they think it’s oppressive that half-naked women are used in advertisements for things that are completely unrelated, like burgers,” she said. She believes that it would be equally oppressive to encourage a Muslim woman who personally chooses to wear a hijab to dress in a more provocative, modernized fashion simply because of Western misconception. Seven years after this transition, Mohammadkhani, who currently sports platinum blonde hair styled into an edgy bob, still does not wear the hijab. However, her dual perspective has reinforced her belief that the hijab should be accepted, despite individual differences in religious affiliation and levels of devotion. Amidst the sea of regularly clothed students, bloody-axed teens and unicorns rush to class or stop for a bite to eat. Halloween at NYU has arrived, and students have delivered. 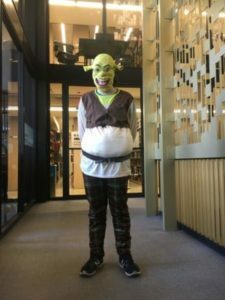 Lev Bernstein, a freshman, hung out casually in the 8th floor hallway of Bobst Library in a full body Shrek costume. 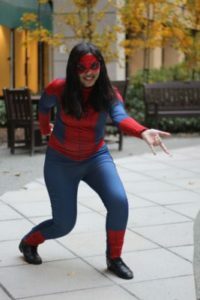 Several other students have similar fearless reasonings for dressing up in costumes ranging from cat ear headbands to an entire Spider-Man suit. “I feel like most people our age don’t dress up anymore, and I just want to normalize that it’s okay,” Capri Christianson, the aforementioned Spider-Man, said. Insecure teenagers often forego the costume tradition of halloween, especially in the harsh light of day. But these NYU students braved classrooms to spread the joy of Halloween. Christianson said her Abnormal Psychology professor called her out in front of a lecture hall of 200 students to comment on her costume, but she’s okay with that. Sophomore Emily Brown, dressed as one-half of a Dolly the Sheep costume, the first animal to ever be cloned. She said she was initially insecure about dressing up, but is glad she did it. Sebastian Abreu chose to rep the gory aspect of Halloween with an axe headband, but said he hadn’t seen many costumes on campus. Emery Whiteman didn’t dress up, but said that when she sees students on campus in costume it puts her in the Halloween spirit. “I think it’s bold to dress up for halloween, in class, and I appreciate it because I don’t have the guts to do it.” she said. Brown loves Halloween because it makes no pretenses to be about anything other than candy, a good time, and costumes. She also referenced the inclusivity of halloween, because for the most part it isn’t associated with any religion, history, or culture. Hannah Whitaker, a sophomore and unicorn for the day, said Halloween is an opportunity for stressed out students to have fun, plain and simple. Marseja Cardwell went as a Martian due to her nickname, “Mars”. She said that wearing and seeing costumes was almost like comic relief from the sometimes overwhelming academic environment of NYU. The rest of her plans for Halloween? 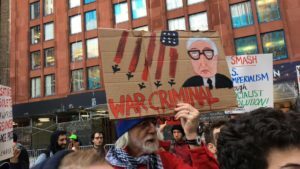 A crowd of over 200 filled NYU’s Gould Plaza yesterday, to protest the university’s decision to host former Secretary of State Henry Kissinger at the Stern School of Business. 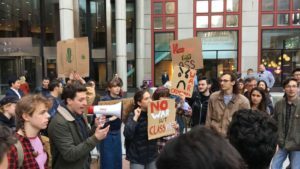 Students and activists screamed chants of “War and occupation will never bring liberation,” and “Hey, Kissinger, what do you say? How many kids have you killed today?” while holding signs that called out Kissinger’s legacy and US intervention in foreign countries. Kissinger was Secretary of State during the Nixon and Ford administrations in the mid to late 70s. He is known for his controversial foreign policy initiatives, including US military intervention is Latin America and South East Asia. Most notably, Kissinger was integral to the decision to bomb Cambodia. Smith was joined by Yoni Chang, a field organizer for the War Resisters League. “The fact that [Kissinger’s] still being invited to gigs, and he’s still being invited you know as somebody whose perspective is meaningful or valuable for the direction we want society to go in, that’s ridiculous,” said Chang. Kissinger was asked to speak at Stern as a part of the school’s “In Conversation with Mervyn King” series. The series, which started in 2016, invites influential figures in economics and politics to engage in conversation with Stern Professor Lord Mervyn King. Twenty-seven activist groups signed a public statement asking NYU to cancel the event. Protestors were invited to speak to the crowd to on behalf of an organization or themselves about the effects of Kissinger’s policies. Worawongwasu called upon NYU to listen to its students. “While NYU continue to market itself as a global network university and perpetuate the rhetoric of neoliberal multiculturalism, we demand accountability in regards to inviting war mongers such as Kissinger onto campus valuing the so-called marketplace of ideas over the lives imperialists such as him have destroyed.” said Worawongwasu. NYU Tisch Freshman Simon Cadel spoke to the crowd about Kissinger’s statements regarding the Jewish community. Cadel recalled that Kissinger’s only positive acknowledgement of his Jewish identity occurred in his defense of Israel. Other students spoke about upheaval in Chile, Ecuador, and Yemen. While the majority of the speakers were students, the crowd varied in age. Mark Woodcock was involved in the anti-war movement during the Vietnam War era. While protests occurred outside the Stern School building, other students disrupted Kissinger’s speech from the inside. NYU sophomore Clayton Farris attended Kissinger’s lecture, in which he and other students stood up at integrals throughout the hour to address Kissinger face to face. Farris and other students were thrown out of the auditorium by security after making comments about Kissinger’s past. Protesters stayed for the duration of the speech. A few braved the cold to stay until Kissinger left the building. Shouting followed Kissinger’s car as he drove away. 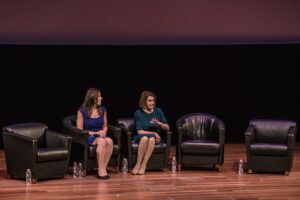 Democratic Congresswoman Nancy Pelosi, the House Minority leader and a focal point of much Republican wrath, spoke at NYU Monday on the role of women in politics, just a few weeks away from the pivotal midterm elections . They spoke about the increased presence of women at all political levels and Pelosi’s personal experiences. A record 256 women won Congressional primaries this fall, of which a majority are Democrats. Currently, less than 20 percent of Congress members are women, according to U.S. News and World Report. Pelosi was the first female Speaker of the House. She recalled a meeting early in her political career with former president George W. Bush and other prominent political figures. Pelosi said that she wants women to be involved in politics starting at younger ages, because that will give them the opportunity to occupy leadership positions earlier and increase their influence. Kristen Gonzalez, a 2018 Columbia University alumna, attended the talk. She is a Queens native who works for a nonprofit called Ignite that empowers women to run for public office. Gonzalez said that she plans to run for City Council in 2021. After Pelosi left the stage, there was a panel discussion with four other women involved in politics, including Alessandra Biaggi, the Democratic candidate for State Senate in New York’s 34th District, which includes parts of the Bronx and Westchester. Gonzalez said that Pelosi’s talk and the panel discussion resonated with her personally. Many of Pelosi’s remarks were words of advice for young women, specifically those planning to be involved in politics. She emphasized the importance of knowing arguments inside out, focusing on the future and being loud enough – particularly in the wake of Brett Kavanaugh’s appointment to the Supreme Court. Near the end, she offered one particularly direct piece of advice. Gonzalez, for one, is ready. The New York City Council held a hearing yesterday to discuss the difficulty many handicapped New Yorkers face getting around the city. The difficulties of getting around the city has made everyday a struggle for disabled New Yorkers. For many, the problem of accessible transportation is larger than just getting from Point A to Point B. First to testify was the Deputy Commissioner of the Taxi Limousine Commission, Jennifer Tavis. The TLC regulates all taxi, chauffeur, and for-hire app based transportation in the city. Tavis was quick to point out the progress of accessibility that has been made in recent years. Despite the progress in accessibility, there is still not nearly enough transportation options for the city’s handicapped, especially in the boroughs. “You are in the boroughs. We are in the boroughs. Why are you ignoring a market of at least 100,000 and rising customers?” Ryan asked to the TLC representatives at the hearing. 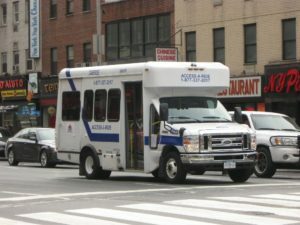 Even with the services provided, such as the MTA’s Access-A-Ride program, the needs of New York’s handicapped community are not being met. New programs, such as Curb, which is an app that can order wheelchair accessible cabs, rarely work. Even with for hire vehicles, like Uber, accessibility is still a big problem for the disabled. “In terms of accessibility, the for hire vehicle sector, which are the app based companies in particular, have not taken the steps they are really obliged to under the Americans With Disabilities Act to provide equivalent service,” Tavis said. The problem of for hire accessibility is just another on a list of issues plaguing the industry on top of recent cab driver suicides and increased traffic congestion. In May, President Donald Trump created a taskforce to evaluate the USPS’s operations and explore the possibility of privatizing the agency. He fears the consequences of the USPS falling out of government control. Congresswoman Grace Meng, a Queens Democrat who helped organize the protest outside of her office, said this is a bipartisan effort. The government response so far has been the bipartisan drafting of House Resolution 993. The resolution, submitted on July 16, explains how the House of Representatives should take measures to ensure the USPS is not lost. 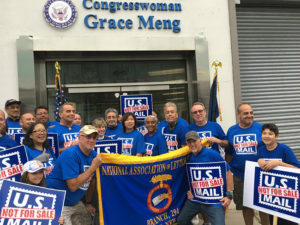 Lillian Pascal, President of the American Postal Workers Union in Flushing, was concerned about what privatization would mean for postal workers. One of the strongest arguments behind privatizing the USPS is that the agency has been consistently losing revenue each year, according to a report. But there is a good explanation for this, said George Mangold, President of the New York State Association of Letter Carriers. The Act mandated the pre-funding of postal worker benefits up to 75 years. At New York University, students cope with tragedy and ongoing stress through a unique source – memes. 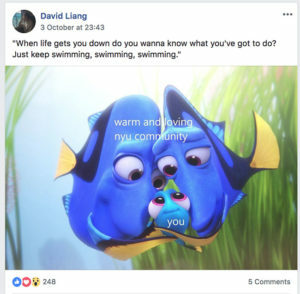 Following the harrowing news of a student suicide on Tuesday, Oct. 2, the student administrators of NYU’s meme page decided to spread messages of hope and awareness to the 11,500 and counting, members of the Facebook group. While internet memes are usually a fairly inane topic, the motivation behind Wholesome Wednesday was solemn and sincere. Paine referenced the painful news of a NYU student’s suicide as the primary reason. The lack of immediate response from NYU authorities concerned him, so they decided to preemptively spread awareness and positivity in the wake of the tragic news. The admins discussed the issue and decided to turn a thoughtless action into an opportunity for connection within the NYU community. A complete rebranding was done. The title of the page was changed to NYU Memes for Wholesome Teens, “Wholesome Wednesday” news was spread, and only “wholesome” posts were approved. But going further than just feel-good images, they decided to spread awareness and provide important contact information for the mental health services offered at NYU. “I expressed that I wanted to address this issue along the lines of reaching out for help,” wrote admin and NYU student, Arystan Tatishev, via email. Several posts and memes included phone numbers and emails for NYU’s wellness center and hotline, as well as encouraging words to others to check in on loved ones and reach out for help if needed. Students have expressed frustration with the lack of response from NYU, however an email from Wellness Services was sent out on Thursday, with no mention of the suicide. Paine referenced suicide clusters, a belief that one suicide can trigger others. There is research that suggests that young people are most affected by suicide clusters, according to the New York Times. Paine’s concern was for the student population not having information to aid them, if necessary, after hearing of the news. The creator of the page, Tatishev, also stressed how important it was to the admins not to trivialize what happened. They decided on a single day theme, and an outpouring of wholesome content followed. 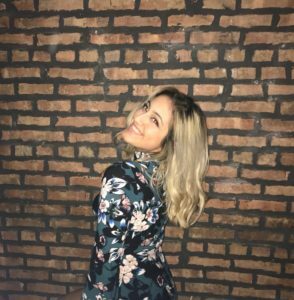 NYU sophomore Emery Whiteman is a member of the meme page and felt like the mission of Wholesome Wednesday had a positive impact. “It reminds you of the friends and family you have, and that you can reach out for support,” she said. That sentiment is emphasized by the flood of comments and likes on the multitude of posts created on Wednesday. Other admins praised member’s contributions and responses in a time of sadness for the NYU community. The mental health services at NYU have been a point of contention and disagreement among students, who say that the services aren’t widespread enough. Comments on Wholesome Wednesday posts detailed flaws in NYU’s system and student’s frustration with their experiences. Paine also cited disappointing interactions with counselors, outsourcing, and unexpected costs. John Stanley, NYU Junior and meme page admin, emphasized student advocacy in order to encourage changes. “As a society, we have a long way to go before we fully legitimize mental health issues, and in a competitive school such as NYU, it’s doubtful that these changes will come without a more specific, vocal demand from students,” Stanley wrote via email. As NYU and students grapple with the realities of mental health at the largest private university in America, online communities like the NYU Meme page hope to be a source of support and positivity. Please contact these services if you or someone you know is having mental health troubles or experiencing thoughts of suicide: National Suicide Prevention Lifeline at 1-800-273-TALK (8255) or the Suicide Crisis Hotline at 1-800-783-2433. For NYU Students or faculty, you can also contact the 24-hour Wellness Exchange hotline at 212-443-9999 or 24-hour chat via the Wellness Exchange app. Protestors gather at the steps of the American Museum of Natural History to protest the museums’s portrayal of indigenous groups and Columbus Day. Photo by Mikaela Gegelys. Protests erupted outside of the American Museum of Natural History, yesterday as hundreds fought against racism and discrimination towards Indigenous people on Columbus Day. In front of the American Museum of Natural History the statue of Theodore Roosevelt, with a Native American man and an African man standing behind him, drew the protestors anger. The believe the statue portrays white supremacy. For the past three years their Columbus Day protest have included demands, to have the statue removed. Regan Deloggans, a member of the indigenous community and of the American Indian Community House, a non-for-profit organization that represents the Native American community in New York City, said the museum is built on racism. Protestor, Samantha Keogh, was part of a broad diverse coalition of protesters, she believes that it is her civic duty to fight for equality. The protests were organized by Decolonize This Place. Members of this group frequently protest on behalf of indigenous rights, racial equality, global work wages, and against gentrification. Every year on Columbus Day, the group organizes an Anti-Columbus Day tour throughout the American Museum of Natural History. After the tour, the protestors gathered on the steps outside of the museum. 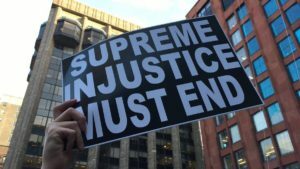 People held banners, wore t-shirts, and recited call and response chants that begged for equality and fair treatment. “We are fighting constantly for recognition, as well as equity.” said Deloggans. 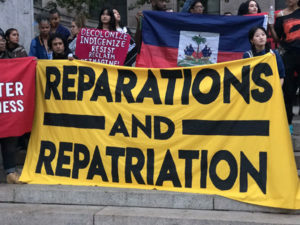 Over a thousand protestors gathered outside the American Museum of Natural History yesterday, to show their frustration with the museum’s legacy of celebrating colonialism. 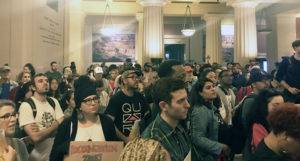 The anti-Columbus Day protest was designed to bring to light the misrepresentation of Native Americans and other people of color in the museum. Activists want the museum to hire more indigenous curators and return artifacts to their original communities. Protestors stood at the museum entrance and handed out tickets for their version of the museum tour. Members of the South Asia Solidarity Initiative stood in the museum hall titled, “The Lore of Asia” holding signs that read, “The Looting of Asia”. Deb, who is of Indian descent, said the museum makes mass generalizations about South Asian people. Activists also demanded the removal of the Theodore Roosevelt statue at the museum’s entrance. Roosevelt is flanked by caricature-like statues of a Native American man, and an African man. While Roosevelt is dressed in his military uniform and riding a horse, the other two statues wear little clothes and walk subserviently at his side. Mirzoeff is not the only New York City educator to bring his students to the American Museum of Natural History. It is the most visited museum in New York City. The majority of the visitors are school groups. “I love to be informed, so I think it’s kind of a disrespect to me on how what I learned [about Columbus and Imperialism] in school is not the same thing I learned outside of school,” said Hanna Mingo, an 11th grade student from the Bronx. The protestors also want Columbus Day to be renamed Indigenous People’s Day. “I think it’s really important to reclaim this day, to really be a presence here, and calling out New York City, first of all, for still recognizing this day as Columbus Day,” said indigenous activist, Lorena Ambrosio. “We don’t want to honor that,” she said. More than 50 U.S. cities have replaced Columbus Day with Indigenous People’s Day. Museum officials did not comment on the protest.